Stream­side plant­i­ngs along the Bushkill. The Catskill Streams Buffer Ini­tia­tive (CSBI) is one of the pri­mary pro­grams the Ashokan Water­shed Stream Man­age­ment Pro­gram offers to stream­side landown­ers. CSBI works with landown­ers to install ripar­ian (stream­side) veg­e­ta­tion for bank sta­bi­liza­tion to stop ero­sion and enhance ripar­ian habi­tat. In 2011 and 2012, CSBI com­pleted 25 projects and reveg­e­tated approx­i­mately 5,400 feet of stream bank. 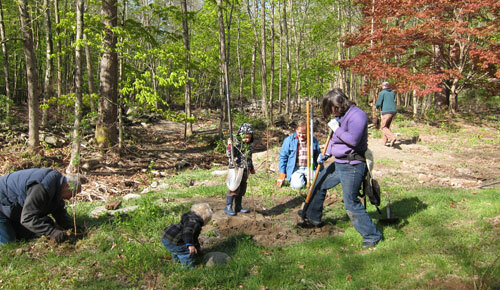 The Ulster County Soil & Water Con­ser­va­tion Dis­trict will assist any landowner with stream man­age­ment questions. For more infor­ma­tion on how to par­tic­i­pate in CSBI, please call the Ashokan Stream Pro­gram office at (845) 688‑3047, or visit the CSBI pro­gram web­site.